Off the busy market square of Nottingham city centre is an old Georgian building that houses one of the last subscription libraries in England. 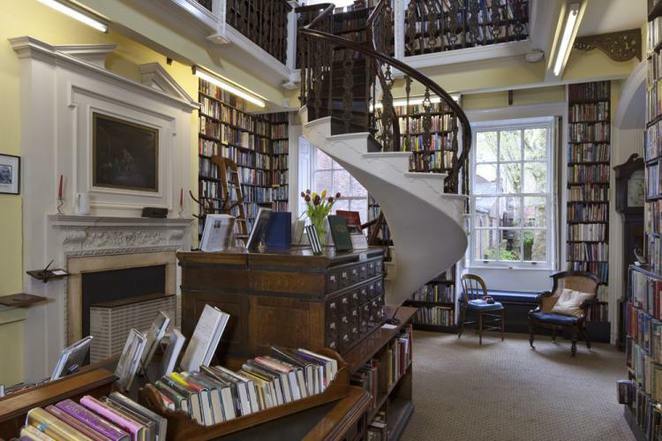 Bromley House Library was founded in the early nineteenth century and holds an eclectic collection of rare manuscripts, early printed books, and works by new authors that are unavailable in more conventional libraries. With its serene reading rooms, spiral staircase, coffee room, 'secret garden', dynamic lectures and conservation efforts, and over 40,000 books, it is an enchanting place for scholars and book lovers. In the entrance to the library there is a three floor staircase surrounded by large paintings, as well as a vibrant exhibition space for artists and photographers. The library also owns one of the last walled gardens in Nottingham, which has been described by the library's website as a 'magical secret garden'. The garden is officially opened every spring with a party for members and the general public. Yellow Hall Exhibition Space. Photo by Erin Connelly. One of the most photogenic features of the library is its beautiful spiral staircase, which is only accessible by one person at a time due to its age and somewhat cracked condition. The stacks of dusty books and lovable eccentricity of Bromley is reminiscent of other urban retreats for the literary aficionado, such as Shakespeare and Company located in the heart of Paris. Spiral Staircase. Photo by Erin Connelly. Membership is available for £90 per year, which provides access to the library's collection, gallery, garden, and members-only lecture series, as well as a dynamic community of like-minded people. The membership is reduced to £45.00 for young people between 18-25. Facilities are also provided to students and researchers on a short-term basis, as well as temporary memberships of £25 for repeat visits. But, you don't have to become a member to enjoy this unique library. Free tours are offered on a fortnightly basis, many art exhibitions (as well as the garden party) are open to the public, and a wide range of lectures, teaching courses, and other events are open to members and non-members alike. See the Bromley House website for full details on visiting as a non-member. The spiral staircase is a great feature.